In quantum mechanics, angular momentum is a vector operator of which the three components have well-defined commutation relations. This operator is the quantum analogue of the classical angular momentum vector. Angular momentum entered quantum mechanics in one of the very first—and most important—papers on the "new" quantum mechanics, the Dreimännerarbeit (three men's work) of Born, Heisenberg and Jordan (1926). In this paper the orbital angular momentum and its eigenstates are already fully covered by the algebraic techniques of commutation relations and step up/down operators that will be treated in the present article. In 1927, Wolfgang Pauli introduced spin angular momentum, which is a form of angular momentum without a classical counterpart. Angular momentum theory—together with its connection to group theory— brought order to a bewildering number of spectroscopic observations in atomic spectroscopy, see, for instance, Wigner's seminal work. When in 1926 electron spin was discovered and Pauli proved less than a year later that spin was a form of angular momentum, its importance rose even further. To date the theory of angular momentum is of great importance in quantum mechanics. It is an indispensable discipline for the working physicist, irrespective of his field of specialization, be it solid state physics, molecular-, atomic,- nuclear,- or even hadronic-structure physics. 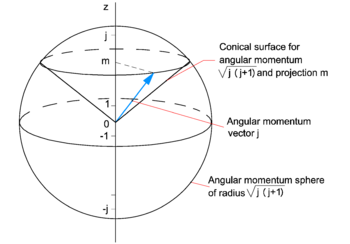 In classical mechanics the angular momentum of a body is a vector that can have any length and any direction. Think of a spinning bicycle wheel. The length of its angular momentum is proportional to its angular velocity (number of revolutions per unit time) and the direction of its angular momentum is along its axle. The angular velocity of the wheel and the direction of the axle are both continuously changeable—in arbitrarily small steps. In quantum theory this is different. where j is the quantum number that determines the length of j. The endpoint of the blue arrow does not cover the full surface of the sphere, but can only lie on the intersection of the sphere and certain quantized cones, because the projection m of j on the z-axis is quantized. The discrete quantum number m is integral or half-integral, depending on whether j is integral or half-integral. The position of the blue arrow on the surface of a cone characterized by certain j and m is completely undetermined, it is equally probable everywhere. This is an illustration of Heisenberg's uncertainty principle. mutually cancel. Since the three components of L do not commute, they do not have a common set of eigenfunctions. so that common eigenfunctions of L2 and one of its components can be found. and this expression appears in the associated Legendre equation. which may be compared with the commutation relations of the orbital angular momenta given earlier. From here on we put . Since a Hermitian operator squared has only real, nonnegative, expectation values, , and since an eigenvalue is a special kind of expectation value—namely one with respect to an eigenvector—it follows that j2 has only non-negative real eigenvalues. Therefore we write its eigenvalue as the squared number a2. The left hand side is nonnegative, while k is unlimited. Thus, if we let k increase, there comes a point that the norm on the left hand side would have to be negative or zero, while the norm on the right hand side would still be positive. A negative norm is in contradiction with the fact that the ket belongs to a Hilbert space. Since no power of the step up operator maps a ket outside Hilbert space, there must exist a maximum value kmax of the integer k, such that the ket , while exactly . For that value of k it follows that a2 = (b + kmax)(b + kmax + 1). Similarly l + 1 times application of j− gives a zero ket with and a2 = (b − lmax)(b − lmax − 1). From the fact that a2 = (b + kmax)(b + kmax + 1) = ( b − lmax)( b − lmax − 1) follows by solving the equation: 2b = lmax − kmax, so that b is integral or half-integral. The quantum number b + k is traditionally designated by m. Also m is either integral or half-integal. The maximum value of m for which the ket will be designated by j = b + kmax. The number j is integral when m is integral and half-integral when m is half integral. Note that a2 = j (j + 1). ↑ E. P. Wigner, Gruppentheorie und ihre Anwendungen auf die Quantenmechanik der Atomspektren, Vieweg Verlag, Braunschweig (1931). Translated into English: J. J. Griffin, Group Theory and its Application to the Quantum Mechanics of Atomic Spectra Academic Press, New York (1959). This page was last modified 16:43, 16 January 2009.